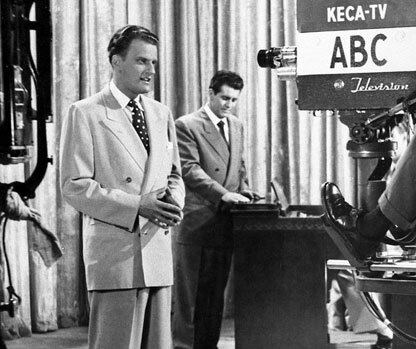 Billy Graham and his team set forth a code of principles that still guides the Billy Graham Evangelistic Association: absolute financial and moral integrity; cooperation with all churches whenever possible; avoidance of emotionalism, sensationalism, and negative preaching; and systematic follow-up of new believers. The local newspapers begin to cover the meetings, thrusting Mr. Graham’s ministry into the national spotlight. 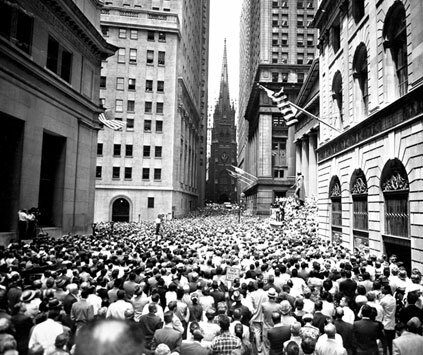 The attention draws overflow crowds, and the Crusade stretches to eight weeks. 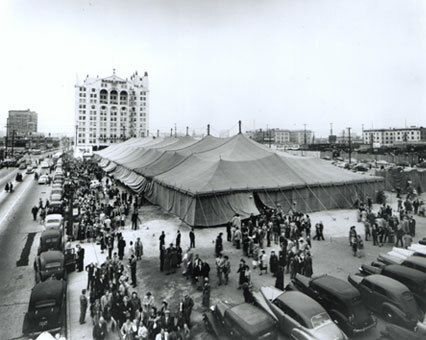 The Hour of Decision, a weekly radio program featuring live broadcasts from Crusade cities, first airs from the Atlanta Crusade on November 5, 1950. BGEA is incorporated as a way to handle correspondence, funds, receipts, and administration. 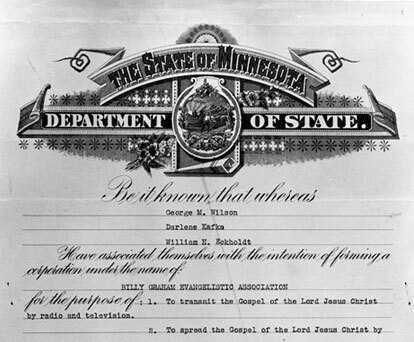 The incorporation papers state a simple purpose: to spread and propagate the Gospel of the Lord Jesus Christ by any and all … means. 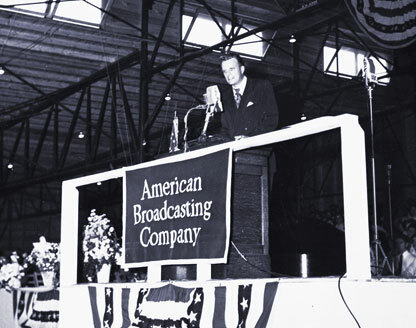 Mr. Graham, Cliff Barrows, and George Beverly Shea produce a weekly program to be shown on as many stations in the United States as possible. Mr. Graham, who believes that the ground is level at the foot of the Cross, reaches a breaking point in Chattanooga. When the head usher insists on segregated seating, Mr. Graham tears down the dividing ropes himself. 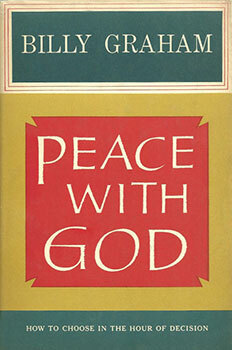 Mr. Graham’s first book, Peace With God, is released. It will eventually be printed in 38 languages and be revised and expanded three decades later. 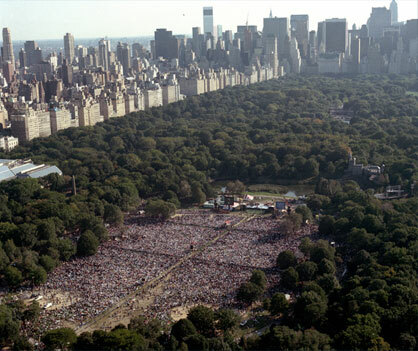 Final Crusade numbers indicate that more than 2,047,000 people attended the event and 38,447 made decisions for Christ. The local committee decides to extend the Crusade for as long as Madison Square Garden is available until Labor Day weekend. 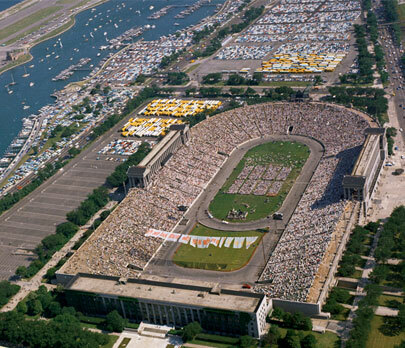 Total attendance exceeds 2.3 million, and more than 61,000 people make commitments to Christ. 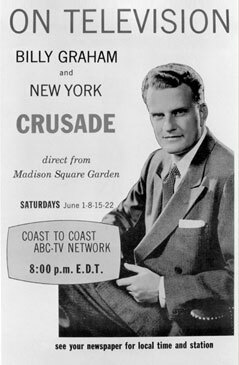 Ratings indicate that 6.5 million people watch ABC’s first live Crusade broadcast from Madison Square Garden during the New York Crusade. 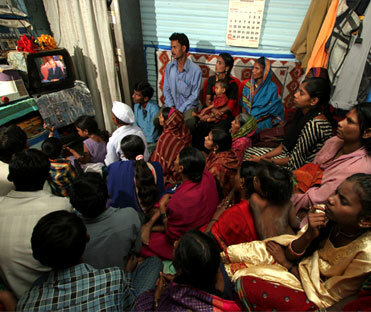 Some 35,000 people write letters indicating that they made a decision for Christ after watching the television programs. More than 3,362,000 people attend meetings in 10 cities in Australia and New Zealand. Some 146,700 respond to an invitation to receive Christ. Soviets rule East Berlin, and Christians fear that they will soon close the borders. Believing it may be their last chance, they invite Billy Graham to hold a Crusade 300 yards from the boundary. 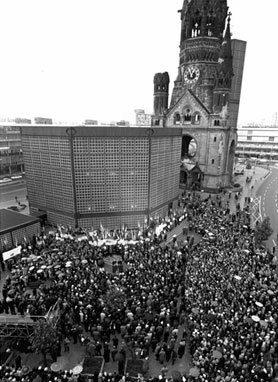 Hundreds of East Berliners attend—although they are spied upon, frisked, pulled off subways, harassed, and ridiculed. During the week, more than 5,200 people make decisions for Christ. Decision—which includes articles with an evangelistic emphasis as well as devotional messages, Bible studies, news of BGEA events, and stories of conversions and changed lives—is soon published in several languages and reaches millions of people around the world. 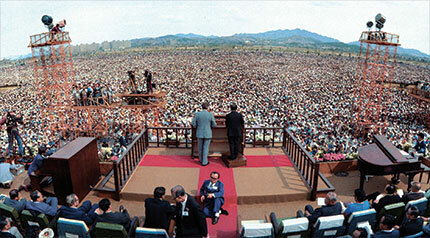 More than 16,500 people make decisions for Christ during the 19-day Crusade. 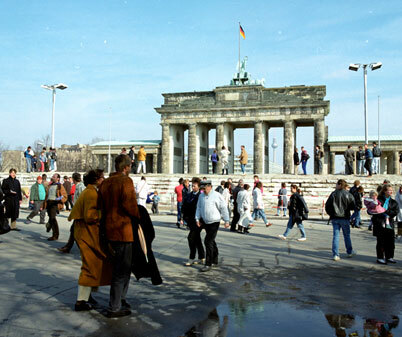 Held in Berlin, West Germany, about 1,200 delegates from 100 countries attend. Beyond forging a new unity among evangelicals, the Congress serves as a catalyst for new efforts in evangelism. 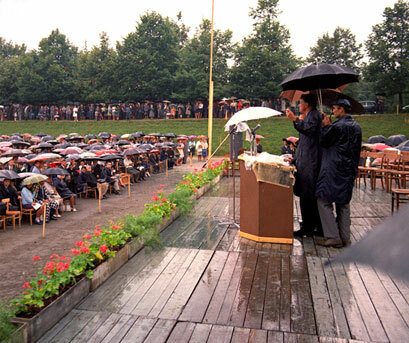 In a field, some 10,000 people sit in a steady rain, listening to Billy Graham. 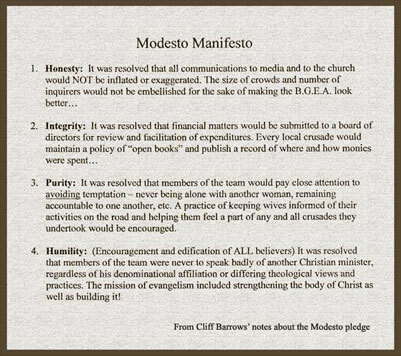 There is no way to record the decisions, but scores raise their hands when invited to receive Christ. 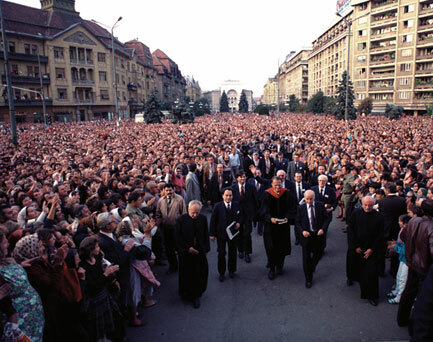 The two meetings are the first open-air evangelistic meetings in Eastern Europe since World War II. 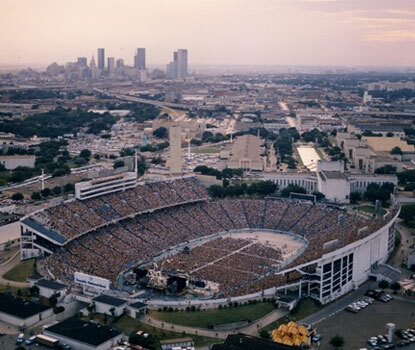 The event held in Dallas, TX features a range of performers, including Johnny Cash, Larry Norman, Love Song, and Andrae Crouch and The Disciples. 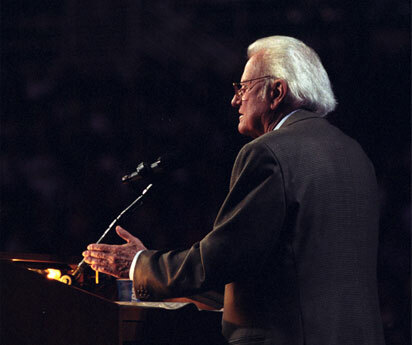 Billy Graham, the conference’s honorary chairman, closes the festival with an evangelistic message. For many years, BGEA has made it a practice to give away a large part of its undesignated income for the support of other evangelistic enterprises and organizations in various parts of the world, including those trying to meet emergency needs. 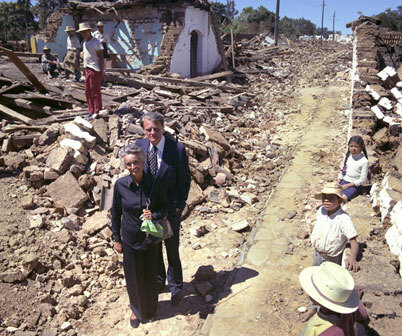 In 1973, the effort is named the World Emergency Fund. 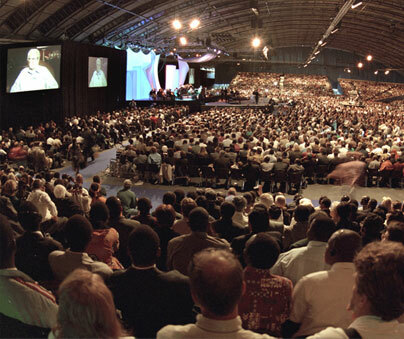 Billy Graham accepts an invitation to speak at the South African Congress on Mission and Evangelism in Durban—a fully integrated meeting of 700 church leaders. 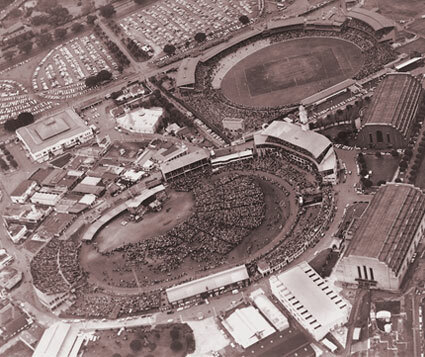 At the congress’s evangelistic rally on March 17, Billy preaches to 45,000 people in King’s Park Rugby Stadium. 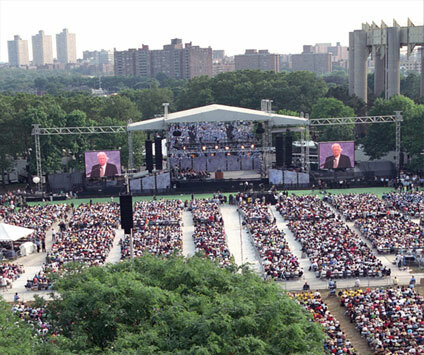 At the closing service, Mr. Graham preaches to more than 1.1 million people—the largest live crowd ever for an evangelistic message. The crowd is so large that it is impossible for inquirers to come forward during the invitation. Instead, they stand to signify a decision, and counselors move through the crowd to speak with them. 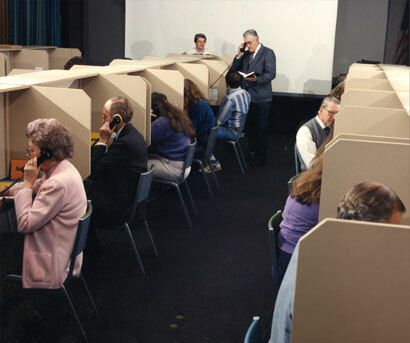 Even though more than 30,000 decision cards are collected during the Crusade, more people speak with counselors than can be recorded. 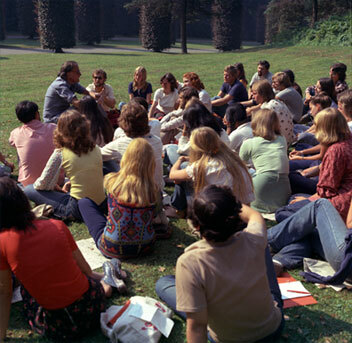 More than 7,000 young people from 40 European countries meet in Brussels for Eurofest ’75, an intensive evangelism training conference that the Billy Graham Evangelistic Association helps to sponsor. Participants from 133 countries gather to study the message, life, and ministry of an evangelist. 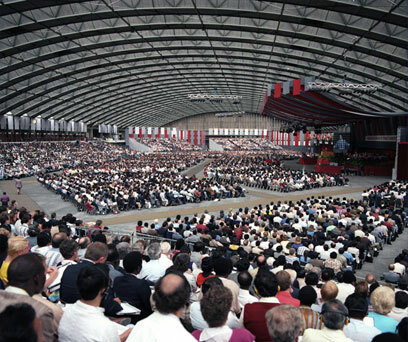 BGEA later organizes Amsterdam Conferences in 1986 and 2000. While in Romania, Mr. Graham speaks at Orthodox and Reformed cathedrals; at Roman Catholic, Baptist, and Pentecostal churches; at a Jewish synagogue; and at an Orthodox monastery. 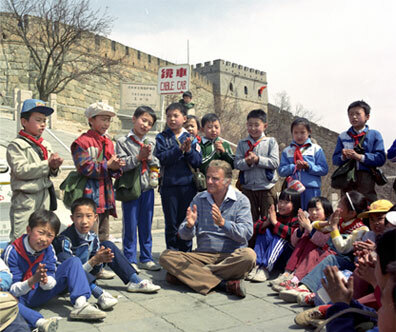 Billy and Ruth Graham travel to China after waiting their entire married life to visit Mrs. Graham’s birthplace. In 17 days they travel 2,000 miles and visit five cities. Mr. Graham has more speaking and preaching engagements, interviews, and social events than any other trip he can remember. At several churches, congregations of thousands gather to hear him speak. 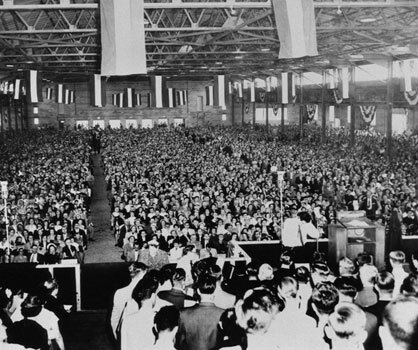 Rally attendees make up Billy Graham’s largest single North American audience. Counselors fluent in Chinese, Korean, and Spanish are available for people listening to the simultaneous language translations on commercial radio. 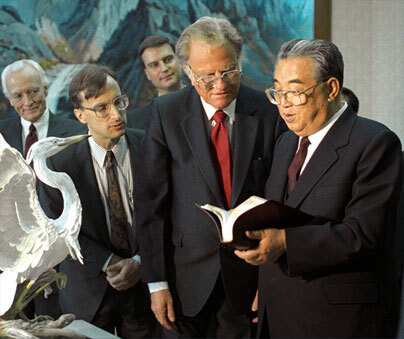 Mr. Graham meets with North Korean President Kim Il Sung and becomes the first foreign-born evangelist to preach in the communist nation of North Korea (the Democratic Republic of Korea). 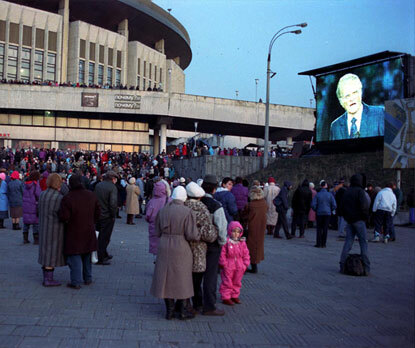 While visiting Moscow in 1959, Billy Graham prayed for the day when the Gospel could be proclaimed in a public arena in Russia. After the fall of the Soviet Union, God answers that prayer. More than 155,000 people attend the three-day event in Moscow’s Olympic Stadium, and more than 42,000 make commitments to Christ. Billy Graham Training Center at The Cove is officially dedicated. The Cove is a 1,200-acre Bible training and retreat center in Asheville, N.C., designed to encourage, refresh and empower believers who want to deepen their faith. 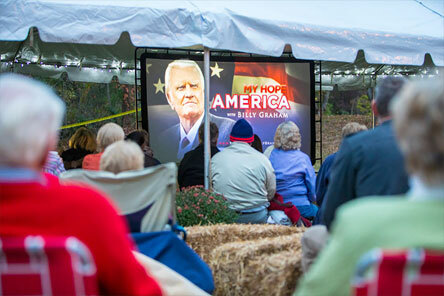 Billy Graham preaches via satellite to an estimated worldwide audience of more than 1 billion people during the Global Mission Crusade. Known as history’s largest one-time Christian outreach, Mr. Graham’s message is interpreted into 116 languages in 185 countries. 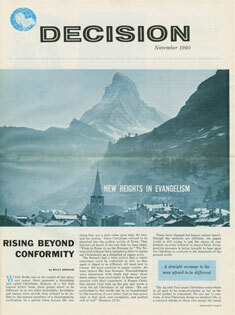 BillyGraham.org now records millions of visits a year, and hosts visitors from nearly 200 countries and territories. In its first seven months, the newly established Response Center receives some 19,000 calls dealing with everything from mailing list changes to leading callers in prayer to receive Christ. BGEA organizes an international conference for itinerant evangelists in Amsterdam, focusing on new methods of evangelism for the 21st century. The participants receive an inspiring challenge during the closing session from Mr. Graham, who is not able to attend in person but participates via satellite. 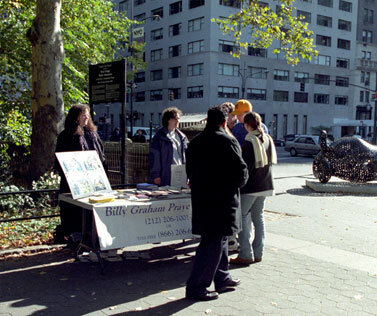 After the September 11 terrorist attacks, a Billy Graham Prayer Center opens near Ground Zero. Following this experience, the Rapid Response Team is started to assist the church community in offering a ministry of presence and appropriately sharing the hope of the Gospel with those affected by man-made or natural disasters. 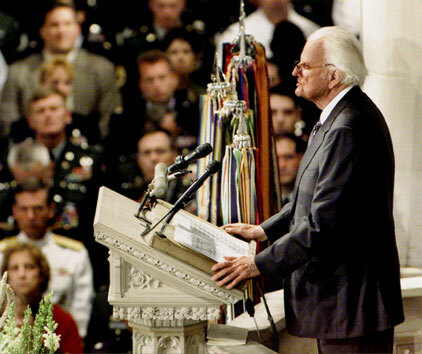 After the September 11 terrorist attacks on the United States, President George W. Bush declares September 14, 2001, a National Day of Prayer and Remembrance and asks Billy Graham to deliver the message at a special service at the National Cathedral in Washington, D.C.
Just as the disciple Matthew invited friends to his home to hear Jesus, Christians invite their family, friends, and neighbors to their homes to watch an evangelistic TV program (which features a message by Billy Graham or Franklin Graham) and to share a meal or a snack. By 2007, more than 8 million people in Asia, Latin America, and Russia make commitments to Christ through the project, surpassing the combined number of commitments to Christ through BGEA dating back to 1950. 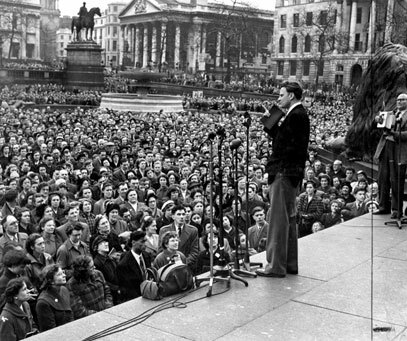 Almost a half century after he first spoke in New York City, Billy Graham returns in June to preach again the unchanging message of Jesus Christ. 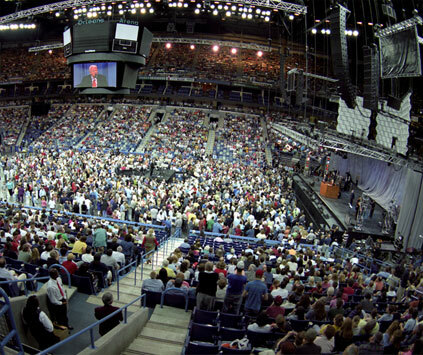 Six months after Hurricane Katrina, Billy Graham and Franklin Graham bring messages of spiritual hope and renewal at the New Orleans Arena, in one of the first major public events held in New Orleans since Katrina devastated the city in August 2005. More than 1,360 people make decisions for Christ during the event. Former Presidents Carter, H.W. 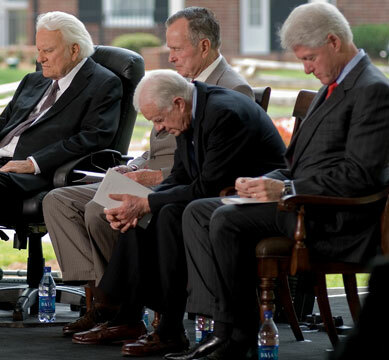 Bush and Clinton joined local officials in Charlotte, N.C., at the dedication service of the Billy Graham Library on May 31. 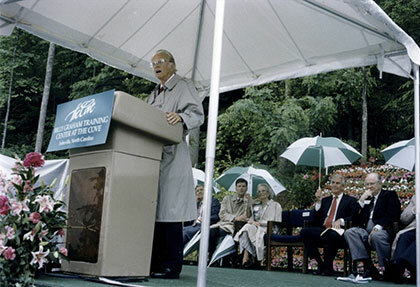 The Library takes visitors on a journey following the steps of Billy Graham’s life—the man, the ministry, the message, and the mission—demonstrating how the Lord guided him as he proclaimed the Gospel of Jesus Christ around the world, giving Library guests an opportunity to accept Christ through faith. 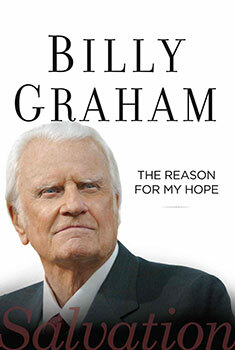 Mr. Graham authors The Reason for My Hope: Salvation only a few months before his 95th birthday. 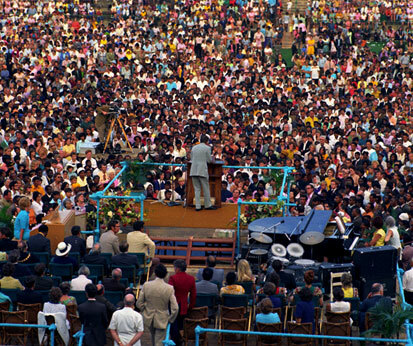 On his 95th birthday, Billy Graham again presents the Gospel to millions of people across North America through My Hope with Billy Graham, involving more than 25,000 churches and thousands of homes and other venues. 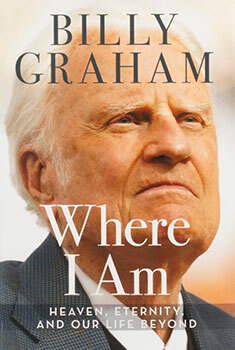 Billy Graham releases last book Where I Am: Heaven, Eternity and Our Life Beyond shortly before his 97th birthday.